Welcome to Virtual Quilting Weekend! Before I forget, next month will be an extended weekend so you can finish those gifts! Dates are December 20-24. As always, please feel free to share pictures of what you're working on. Hopefully I'll be able to post some this time. I put my navy bear paw back in the tub. I was just tired of looking at it. Now on the design wall is an Autumn Sampler by Judit Hajdu from quilt fox designs. It is one of my UFOs and it was that one's turn to come out of the tub and see if I could advance it at all. 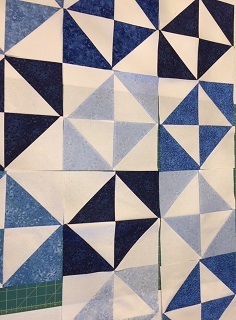 There are 17 blocks and I have 8 done plus one sashing. 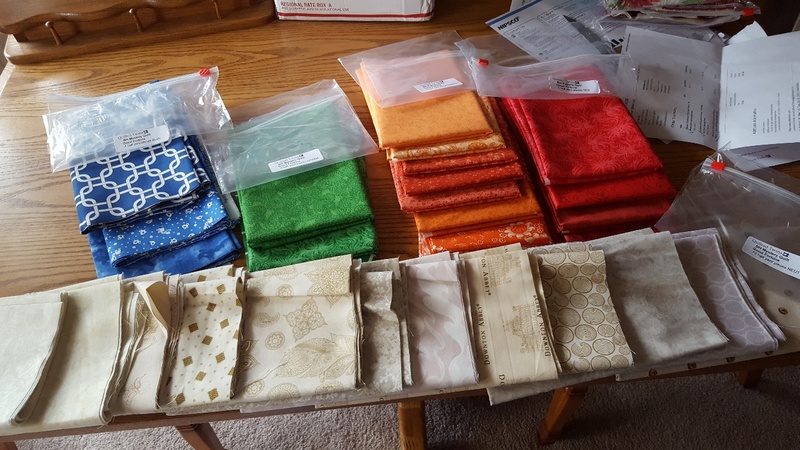 I got my Good Fortune BHMQ fabrics today. 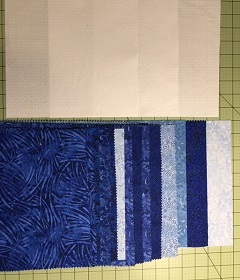 I'm going to swap out one of the blues for some blueberry fabric and may be one of the greens. Pictured here. But into a new tub they go as we have no clues yet. Autunm Sampler by Quilt Fox Designs. Working on my 8th block. A little wall hanging for my wonderful brother-in-law. He always sends us cute stuff for Halloween, I plan to surprise him for Christmas. Battle Axe, I love the blocks you have started. As usual, I have several baby quilts that need to have their bindings attached, and three tops that need sandwiching, etc. I have a couple dozen finished quilts, 24 crib sheets, and lots of other odds and ends ready to be taken to the pregnancy center. I'll deliver them right after the VQW and add the ones I finish this weekend. I'm going to be at Quilt Festival this weekend so I won't be sewing, but I'll be looking in here in the evenings to see what others are doing. Your sampler blocks are gorgeous, Battle Axe. Love the fall colors. That's going to be a pretty quilt. I finished some blocks today that I needed to enlarge hubby's bed quilt. I have to remove the binding on two sides and add two more vertical rows and one horizontal one. Since the quilt is done, I will have to add the new rows and Quilt-As-You-Go, then put the binding back on, adding some additional length. Maybe I'll get to that this weekend. What I really want to do is some flannel rag quilts in animal shapes. I've had patterns and fabric standing by for several months. So we will see if I am good and finish hubby's quilt, or bad and jump into a completely new project! So..... I am positively jumpy every time I get a notification on my phone!! 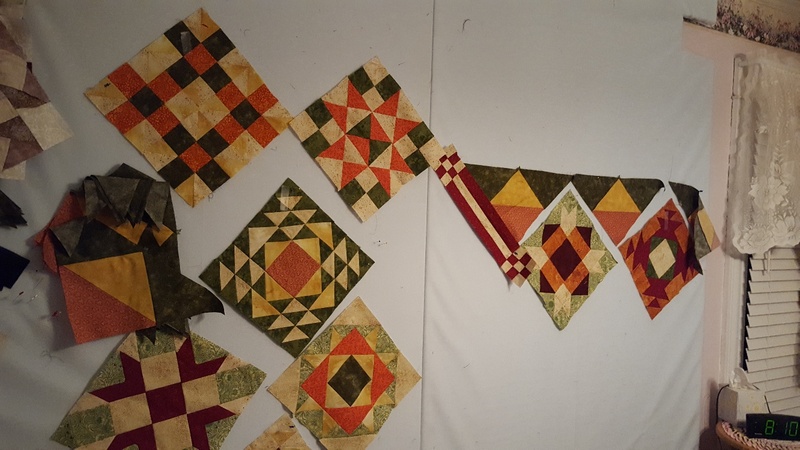 Wow, SBG, looks like a lot of work for Hubby's quilt. Did he suddenly grow? Oh boy zozee, looks like we will have some news soon. I'm in--almost finished a tunic dress for daughter that is going to Nepal in late Oct for volunteer work for a month--dang fabric is so slippery--my Mom would have called it sleezy! So ready for some cotton quilting fabrics! It's snowing here south of Kansas City and I'm hoping school gets called off tomorrow (wet roads freezing overnight) so I can work on a customer quilt on LA and even get started on a wall hanging that will be siblings Christmas presents--keep your fingers crossed! Yeh! I've had a very busy week and ready to quilt. Don't care what it is, just so I get to touch fabric. Also must do laundry and clean dishes. And, it's already Friday so I could start now. We'll see, it's also bedtime. With insomnia bedtime is whenever I can convince my brain to go to sleep. LOL, no, I just didn’t make it quite large enough. It only just barely reaches across the top of his bed, from edge to edge. When I enlarge it, it will have about a foot overhang all the way around the bed. Great! I need a sewing weekend as I just started a new quilt. Would love to have it finished for a Christmas/Birthday celebration for a special friend turning 92. My son and I will meet up for get together on Saturday to celebrate a big success for him. It snowed last night and continues this morning, so I have the perfect excuse to hunker down after work today and unsew that pesky jelly roll rug with the huge waves in it. Yay...I finally get to participate. DH is going to visit his 98 yr old mother in Massachusetts and I get the house to myself. Patrice, I’m jealous that you will be at the Quilt show. It’s on my bucket list. Don’t forget to post photos. 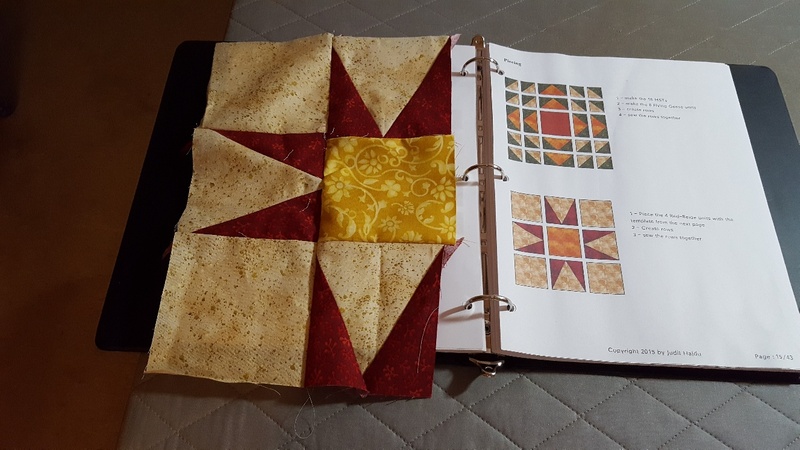 SBG, your task of adding to your DH’s quilt sounds a little daunting...have you already constructed the additional blocks? Zozee, what an exciting time for you and your family. Grandbabies are such a joy. I am going to piece the backing for ORL as I finally got the yardage in the mail from Craftsy (it was on sale). I also received a piece of Moda grunge in Chiffon (yellow) in the mail that I could not get at my LQS which I am going to use to finish the checkerboard blocks and sashing of Long Time Gone so I can get it assembled. Don’t know how much sewing I’ll get done, but I’ll be checking in to see what everyone’s working on. Great timing for VQW! Today I am packing up to attend a Bonnie Hunter class in the morning. I will be starting her Midnight Flight, but I have tweaked the colors a bit. Last weekend I was at a retreat, so I have a Podunk Pretties design to put the last borders on and then it will be finished. Here are my Midnight Flight fabrics and the center section of Sweet Sixteen. Marcia, your Autumn sampler is so pretty! Well, I got the machine quilting done. Just a simple echo of the fractured jar. I sewed the first two sides of the binding, (the machine part). This evening I will do the hand stitching while I watch some television. It will be done by tomorrow, so I have to think of something else to work on. Boston and Vagabond....your skill amazes me. Just really creative. I must have fallen asleep at the sewing machine, as I woke up to this in my lap. The directions said to find a printer that enlarged the template to ?? and now I remember this block is why it became a UFO in the first place. Battle Axe, positively love the sampler you are working on. I went to Quiltfox design on Etsy (or was it Craftsy??) and could not find it. I did find a sampler BOM but the blocks didn't look the same as what you are working on. This weekend I am longarming a Toni Whitney Blue Heron wall hanging for a client. I am giving it a trapunto type treatment where I quilt the details in the heron with just the top and batting loaded. Then I trim away all the extra batting and sandwich as normal and quilt in all the background. I completed the trapunto part so now I just have to sandwich and reload. Then I have another quilt to start marking to get loaded. Practically salivating over this one because I have a very solid game plan for it and can't wait to sink my teeth into it. This is also a client quilt and seems every top I get from her gets my creative juices flowing like crazy. Love working on her tops! Very optimistic I will get it loaded by sunday. As I have Monday off and nothing on my agenda except a vet appointment first thing in the AM, I should be able to quilt all day on Monday. Happy dance! 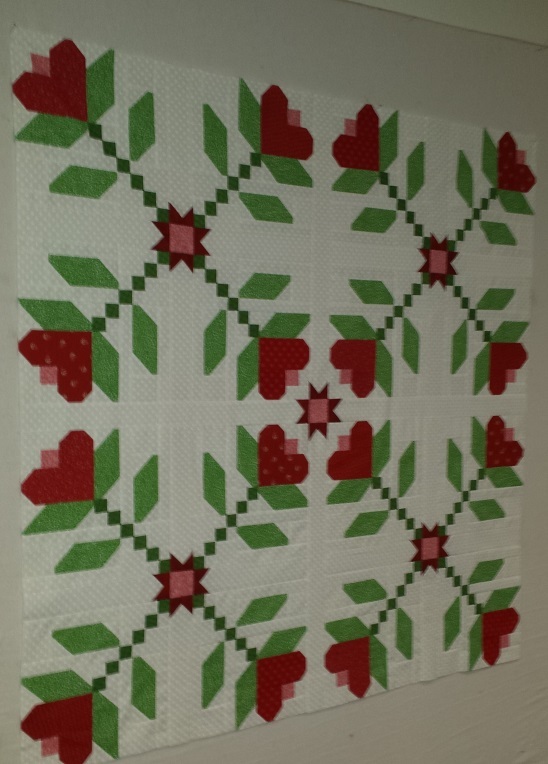 Finally, I have to finish up piecing a backing for one of my own. Backing isn't the right word as this is a reversible quilt and the "backing" is more complex than the "top" and has taken twice as long. But I will be loading this as the backing so that is why I refer to it as such. All the quilting is going to be dictated by the top as that has a lot of applique. I already have most of it pieced together so only have one long joining seam then borders. Last edited by feline fanatic; 11-09-2018 at 08:48 AM. Fun seeing all the pictures, especially the autumn colors, battleax. I will be celebrating an anniversary this weekend but may get some sewing done. 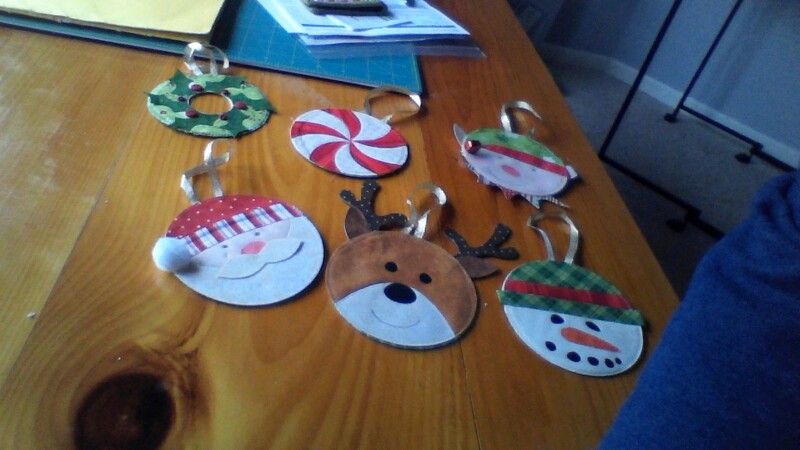 Yay for progress on your projects! Time Check here to keep me on track with all of you. This is the start of the first 20 blocks. I may add more blocks or wide borders to make up the size. 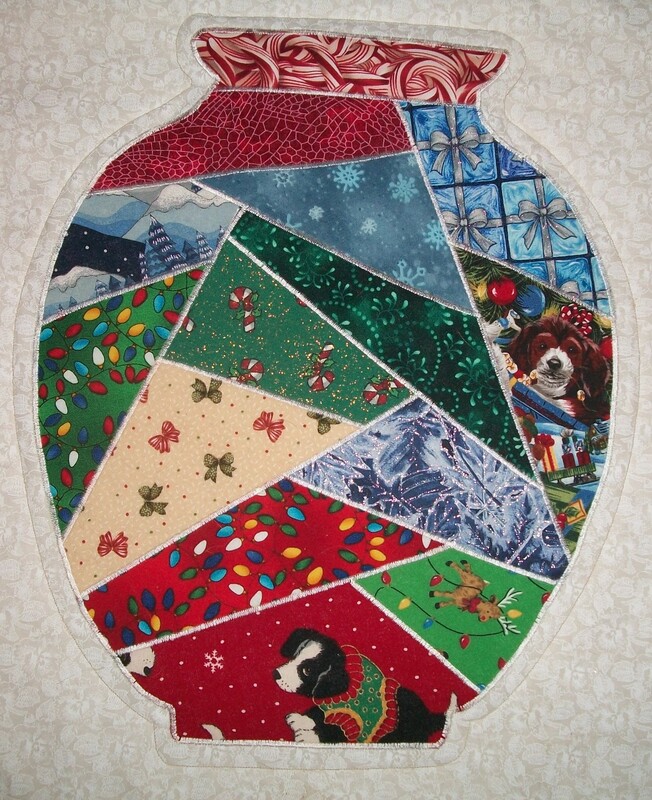 The quilter is still taking quilts for Christmas so I want to get this one to them quickly. 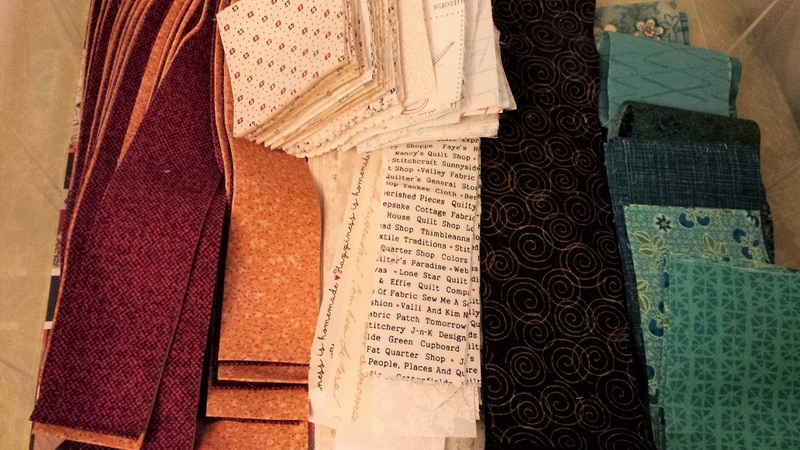 Here is a sneak peek at the fabrics and a little progress. I can already see that some of the blocks are turned the wrong way. Due to timing issues, I'm not sure if it will become the Disappearing Hourglass. Sewing but not quilt related, alas. I'm making pleated valances for bedroom windows....and making it up as I go along, so I hope they work. Hopefully I will feel better tomorrow, have a sinus infection so started antibiotics today. 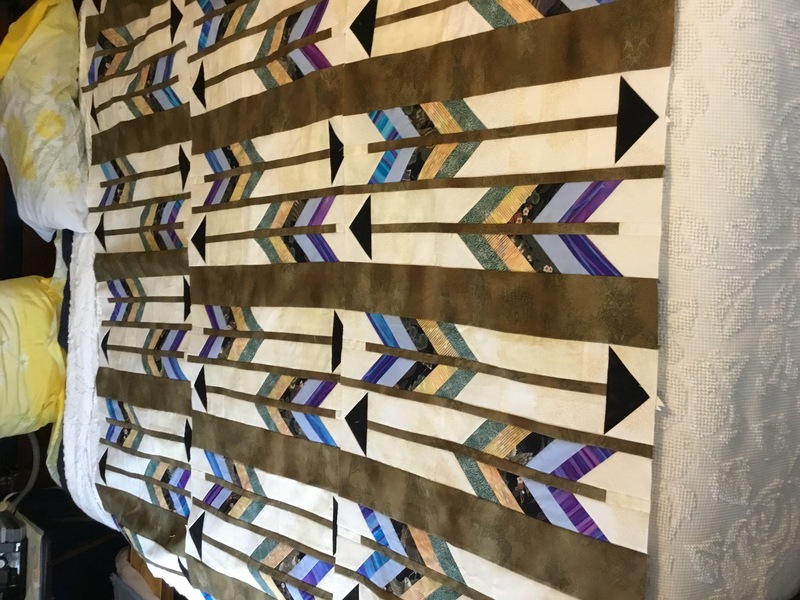 I really want to make more progress on my arrow quilt. Finally got my fabric mostly unpacked and came up with hopefully enough to finish. Did have to go and buy another piece of blue. It doesn’t match all the rest but will do.